Back in 1969 our idea of working with and helping music educators began with some solid business sense and great personalized customer service. As our business grew and our customer base expanded we were asked to be creative and inventive to meet the needs of additional future customers inside and outside of South Texas. This is when we began manufacturing and providing music educators with anything they would need for their music areas. 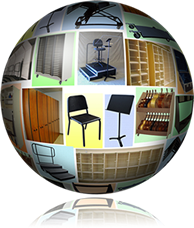 Our extensive list of band cabinets, uniform and wardrobe storage, library music systems, stands, carts, chairs, and acoustic solutions will give you everything you need. We are here to help you with floor plans, storage issues, and any equipment needs you may have. Melhart's products and designs are evolving to meet the growing demands of our customer's unique teaching environment. Our business development team constantly communicates with our existing customer base to understand the many challenges of space management and equipment storage so that we can offer innovative solutions and improvements for the future.